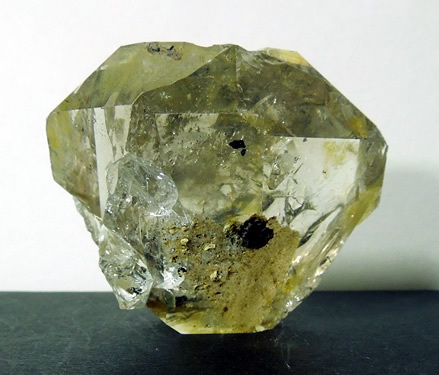 Wow, there are so many features that make this huge Herkimer Diamond special. An unusual event occurred during the 2016 Summer Solstice. Not seen since 1967, we enjoyed a full moon. Coined the Strawberry Moon by the Algonquin tribes because June’s full moon signaled the beginning of the strawberry picking season. 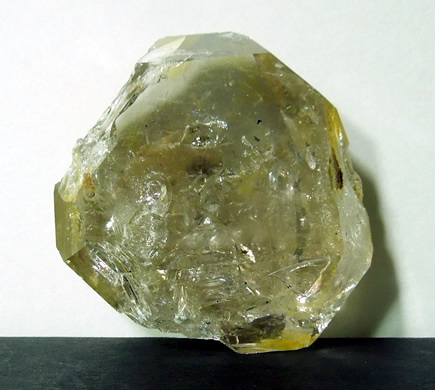 This Herkimer Diamond was charged outside during that 3 day solstice period - June 20 - 23, 2016. Since Mother Earth created this crystal over 300 million years ago, not one but myself and my husband have ever touched it. 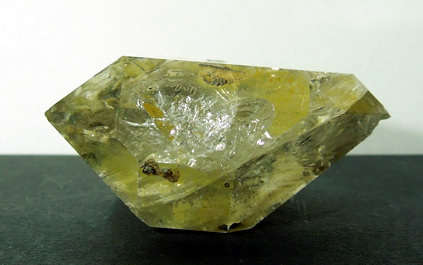 A most unusual metaphysical feature for any crystal or stone. 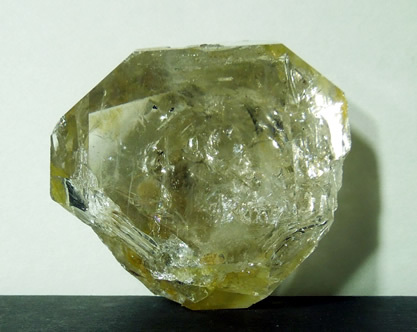 At over 2 inches in length and width, it's size is huge by Herkimer standards. Chisel points (flat rather than pointed tips) give it an unusual shape. We call it a 'Superman' shape and it shows in the images. 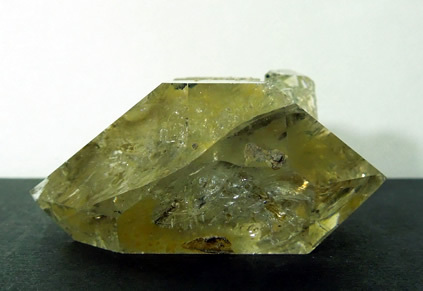 It has a thin depth that can be seen in the images as well; giving it the feel of a tabby crystal. 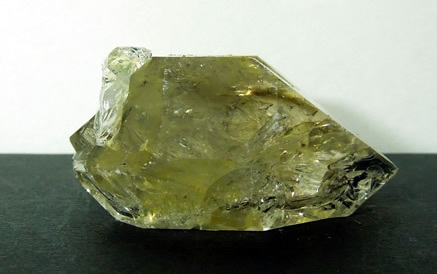 A large smooth facet covers one side, and most all facets (or faces) are clean and smooth. The back, center area does have a matrix attachment. A 16 mm bridge crystal sits next to this area. It's complete, but a shallow key covers much of it. There is too much to mention everything going on internally. One termination is very clear. Other areas have great clarity, other areas are smoky. Clear bubbles, healed fractures, rainbows and touches of iron oxide. Note: The iron oxide really reflected in the images. The crystal is not as yellow in person. 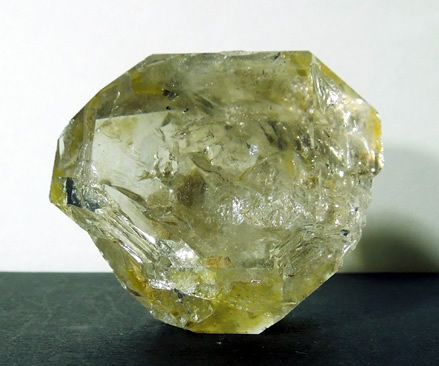 This unusual and large Herkimer Diamond is truly 'one of a kind'. And it is huge, literally a handful of a crystal. 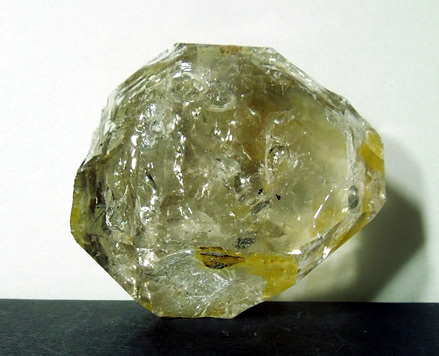 A huge fantastic Herkimer Diamond specimen.